Since Monday was Patriots Day, as well as the running of the Boston Marathon, I’m celebrating this week—in an art historical way, of course—with one of my favorite colonial portrait painters: Joseph Badger. He is sort of in the shade (art historically speaking) of more prominent early painters such as John Smibert (1688–1751) and John Singleton Copley (1738–1815). All three artists were active in Boston at some point. Once the American colonies were prosperous, well-to-do Americans wanted to show that they had just as much class as their English counterparts, and one way was by commissioning portraits. Portraiture was, aside from overmantle landscapes, practically the only subject matter in early American painting. In the first three decades of the 18th century, prosperous Americans preferred to have their portraits painted by artists born and trained in Europe, primarily in England. 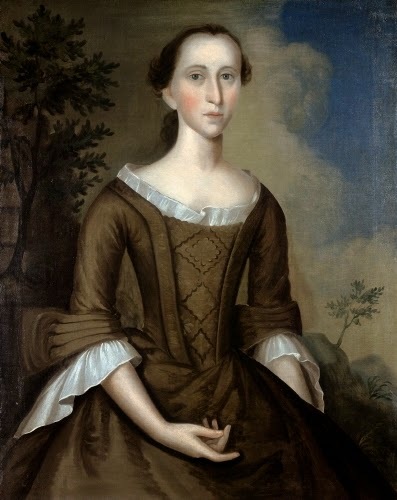 These painters, such as Peter Pelham (1691–1751), John Wollaston (c. 1710–1775), and John Smibert, were able to portray fashionable colonists in the same idealized, courtly style as English gentry. With Smibert in Boston gone by mid-century, the vacuum was filled by artists such as Badger. Badger was evidently wholly self-trained. He moved from his native Charlestown into Boston in 1733 to work as a house and sign painter. 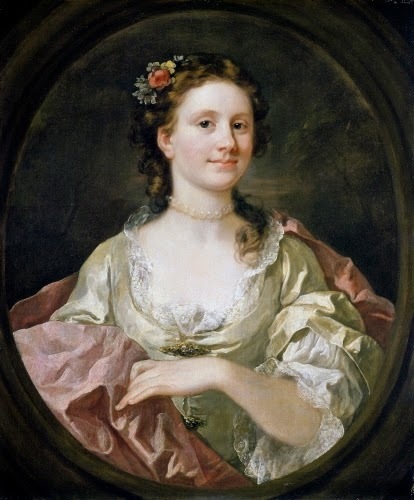 He took up portraiture in 1740, and may have visited Smibert’s studio in Boston as it was near his. Badger rose in prominence in 1746 after Smibert’s retirement. He thrived as a portrait painter until the 1760s, when he was eclipsed by the more sophisticated style of a younger contemporary (and eventual royalist), John Singleton Copley. 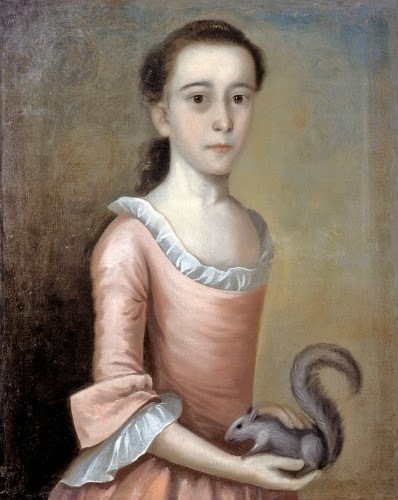 Badger’s lack of training is evident in his unsophisticated, stiff treatment of the human figure, and simple, forthright likeness of the sitter, as seen in Mrs. John Haskins. The presentational gesture of her right hand is an English 1600s and 1700s portrait device meant to point to the sitter’s accomplishments, material success, or, in this case, to a companion portrait of her husband. Like English portraiture, Haskins is surrounded by a filmy, non-specific landscape populated by wispy trees and a glowing sky, which forms an aura around the figure. 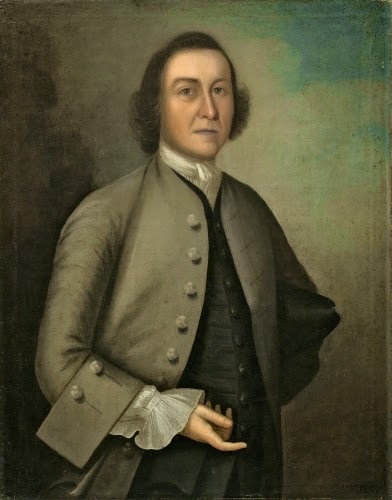 This portrait by William Hogarth (1697–1764) from roughly the same period shows interesting differences in how the English late-Baroque style translated in America. What I love about American portraiture from the pre-Revolutionary period is the absolute fidelity to the sitter’s likeness. This penchant for unvarnished realism in American painting is what I believe makes it a standout against European painting of the period—an honest, forthright and sympathetic depiction of people who were blazing trails in a totally new country, away from the many decadent indulgences of the prosperous classes in Europe at the time.